I probably watched 40-50% game time of the whole tournament. Fielding was below average. There were some good efforts in the ground fielding. Most of the stunning catches were taken by foreign players. There were simply too many regulation catches dropped by locals. Keeping was below par. Had another great chat with cricket Khor's Kawsar Bhai! This one was on BPL, a smogarsbord of topics really. Ideally, want to devote separate videos for each topic exclusively in the future. Oh, this one was in Bangla as well, which is always nice. BPL have become more of a deterrence than any benefit to Bangladesh cricket. National team would have done better by preparing for the NZ series/WC. Domestic cricket would have done better by starting DPL early. 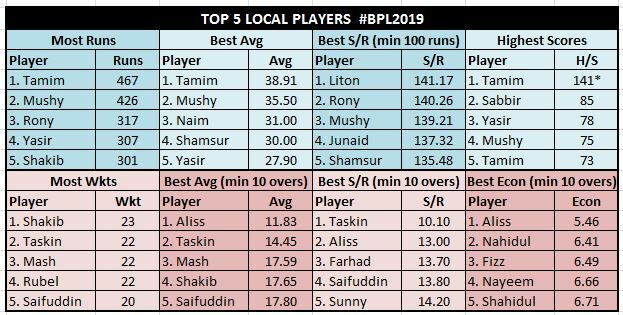 More importantly, BCB would have done better by spending the money on infrastructure development than wasting so much on this meaningless tournament. If the intent is to develop our cricketers for T20 format, start a domestic league where our own cricketers will get to flourish, where no more than two foreigners should be allowed.